Katsushika Hokusai was a brilliant artist, ukiyo-e painter and print maker, best known for his wood block print series Thirty-Six Views of Mount Fuji, which contain the prints The Great Wave and Fuji in Clear Weather. 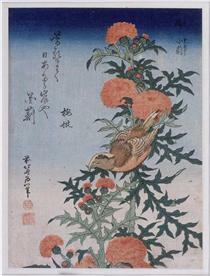 These prints are famous both in Japan and overseas, and have left a lasting image in the worldwide art world. Hokusai began painting at the age of six, and by 18 he had been accepted into the Katsukawa Shunsho school, in which he specialized in wood-block prints and painting. 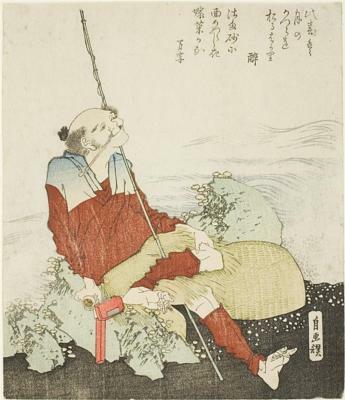 After Shunsho’s death, Hokusai was expelled from the school by a rival, a humiliating experience which he later credited to his created development and artistic growth. He began painting landscapes and images of daily life. 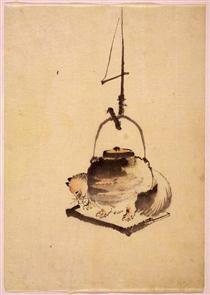 He eventually broke from all other schools of painting and began teaching other students, over fifty in his lifetime. At the age of 88, on his deathbed, it is said that he exclaimed that he needed only five more years of life, in order to become a real painter. Katsushika Hokusai (葛飾 北斎, listen (help·info), c. October 31, 1760 – May 10, 1849) was a Japanese artist, ukiyo-e painter and printmaker of the Edo period. 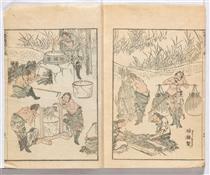 He was influenced by Sesshū Tōyō and other styles of Chinese painting. Born in Edo (now Tokyo), Hokusai is best known as author of the woodblock print series Thirty-six Views of Mount Fuji (富嶽三十六景, Fugaku Sanjūroku-kei, c. 1831) which includes the internationally iconic print, The Great Wave off Kanagawa. Carp leaping up a cascade Katsushika Hokusai ? 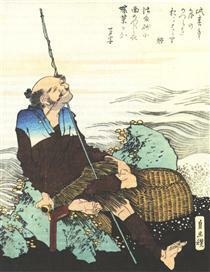 Hodogaya on the Tokaido Katsushika Hokusai ? 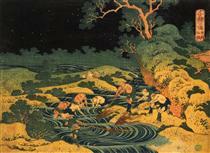 Images of Bathers (Bathing People) Katsushika Hokusai ? The Dragon of Smoke Escaping from Mount Fuji Katsushika Hokusai ?